Today i want to do a quick post about “MultiSelect Option Set”, one of the most awaited feature in Dynamics 365. It used be a frequent business need and we end up developing HTML web resource and N to N relationship with custom entity to provide required functionality. I like the new control and its easy of use. There are quite a good number of blog posts talking about this new feature. However, I wanted to mention some of my observations about this new control. MultiSelect Option Set allows maximum of 150 values to be selected. 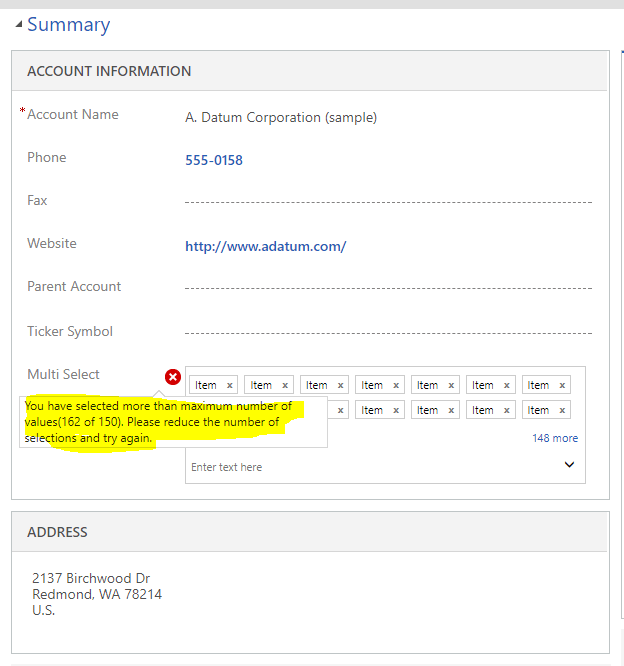 If we try to select more than 150 and try to save the form we will get following error. 2. We cannot set default vlaue(s) during the field customization. 3. setValue() method expects an array as it’s parameter and overwrites existing selected options. I know it’s too early to make a comment until SDK for v9.0 is released as we may expects to see some new methods specifically for MutliSelect Option Set control.